On an Overgrown Path mentions the Lincoln Center concert of Music from the Other Germany which took place on January 25th. One should not forget that there was also a tradition of popular protest song in the German Democratic Republic, a theme explored by David Robb’s edited collection, Protest Song in East and West Germany since the 1960s. In the GDR the political song was not the commercial industry it was in the West, but nonetheless enjoyed a similar popularity due to its ambiguous position as either treasured revolutionary heritage or forbidden fruit in a climate of censorship. 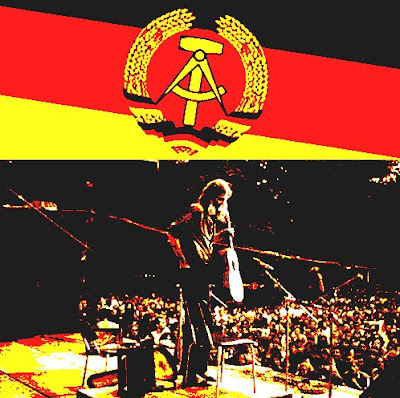 Indeed it was such a controversial force that the expatriation of the singer-songwriter Wolf Biermann in 1976 caused a political scandal that many deem to have heralded the beginning of the end of the GDR. After the euphoria of the Aufbau years, it is clear - at least from the 1970s onwards - that the theme of the stagnation and the betrayal of the revolutionary tradition takes precedence. This is continually stressed in the work of critical Liedermacher such as Biermann and Karls Enkel. Both of these take the theme of the Spanish Civil War - an event that had inspired the most utopian of political songs - to express their preoccupations with the GDR’s failure to progress toward utopia. My own favourite among the West Germans is Konstantin Wecker. As Annette Blühdorn writes in her chapter, Wecker was never bound to Marxist philosophy, belonging somewhere between the idealism of the 1968 movement and postmodernism. Wecker believes in progress and sees songs as a means of enlightenment, but is sceptical of theories and of the ability of songs to change society. Rather he advocates a general form of resistance against ideological control and social conformity. This is evident in songs dealing with witch hunts against Andersdenkenden and songs written from the perspectives of social outsiders. In the last two decades he has supported the anti-globalization and the peace movement, his song “Sage Nein!” voicing his opposition to American military involvement in Iraq. David Robb’s rather unusual first-hand experience performing semi-professionally in the GDR folk scene in the 1980s enables him to provide an insider’s view of the contradictions political singers encountered there. While his own chapter on the GDR examines literary and musical developments from the late 1970s onwards, it also describes the dilemma of many singers having to conform with a system in order to attain a public platform from which to criticize it. Robb offers a case study of the group Karls Enkel and its struggle to maintain artistic and political autonomy in the face of pressure from the notorious Stasi secret police. 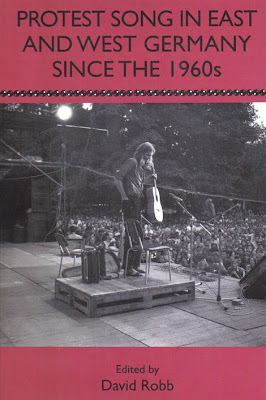 Protest Song in East and West Germany since the 1960s is published in hardcover by Camden House and may be ordered from all good booksellers. PLEASE HELP SUPPORT THE CAUSE OF THE BPSP AND DROP US A LINE(www.myspace.com/berlusconisp)!